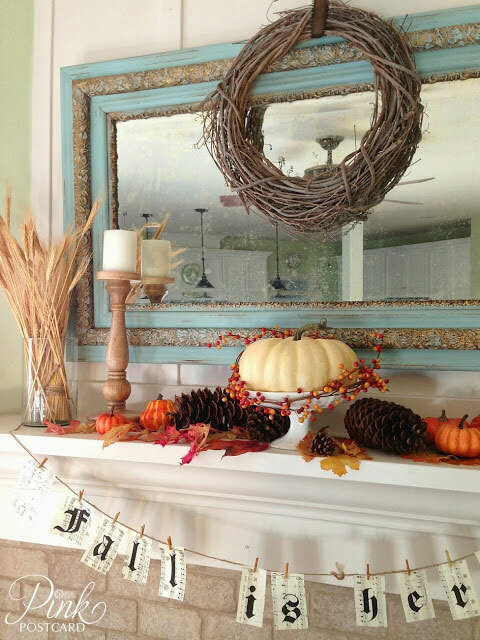 With the changing of seasons and holidays also comes the changing of mantel decor. It is one of my favorite things to do! 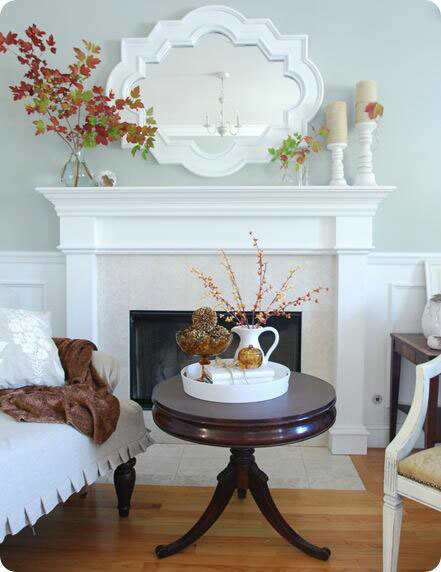 Just switching out a few objects on a mantel can really change the feel of the whole room. As I searched for new ideas for Fall, I was not disappointed by all the creative and gorgeous mantels that I found. 1. The whole fireplace by The Frugal Homemaker. This one is obviously more than just the mantel but the whole fireplace! I love all of the old windows, shutters and weathered wood incorporated into this design. 2. 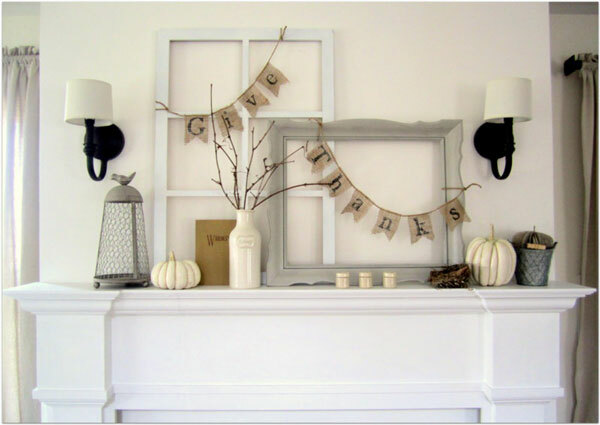 Simple fall mantel by The Pink Postcard. Adding a few natural items in a decorative way is a simple way to get a great look for Fall. My favorite is the white pumpkin on the pedestal dish surrounded by the pip berries. 3. 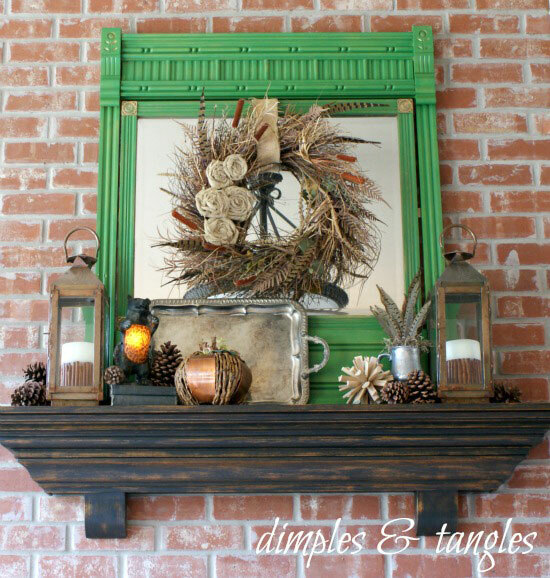 Rustic Fall mantel by Dimples and Tangles. Feathers, pinecones and rusty lanterns make this mantel look especially rustic and warm. The pop of green in the mirror adds just the right amount of color for a cheery background. 4. Halloween mantel by Positvely Splendid. 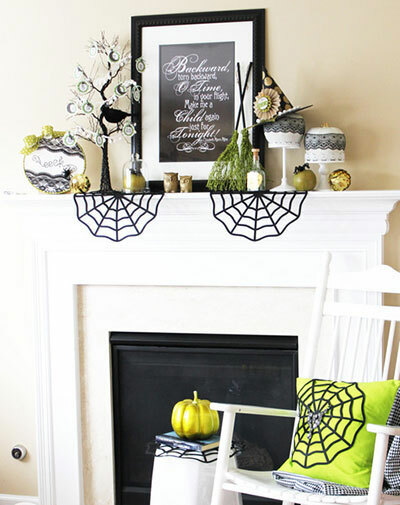 I had to included at least one straight up Halloween idea for Fall mantels! This is such a fun one with all of the black and white. I don’t even mind the webs! 5. 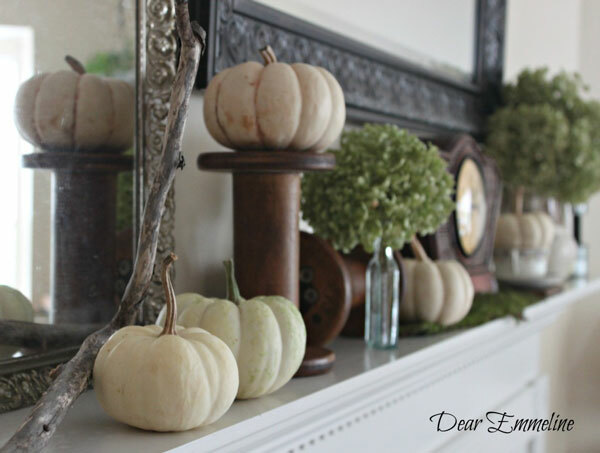 Vintage Fall mantel by Dear Emmeline. Another simple idea to incorporate with what you have is to simply add white pumpkins or gourds. The vintage bobbins make an excellent pedestal to give some height and dimension to the arranging of the pumpkins. 6. Thanksgiving Fall mantel by Proverbs 31 Girl. Hanging a “give thanks” banner is perfect for Thanksgiving or really any time. The soft neutral colors of this design are so pleasant to look at and can carry through for the entire Fall season. 7. Orange and white mantel by Denise In Bloom. Here is another vintage inspired mantel using a lot of orange and white. The look is quite striking and cheery! 8. 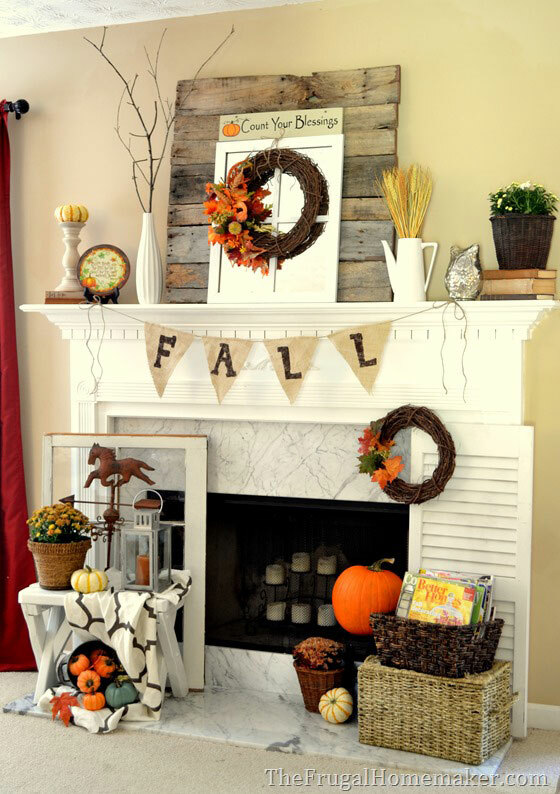 Chic Fall mantel decor by Sweet Something Design. How about this one for a super chic Fall design? Did you notice the squirrel sitting in front of the word “Fall”? 9. Lots of leaves fireplace mantel by Centsational Girl. 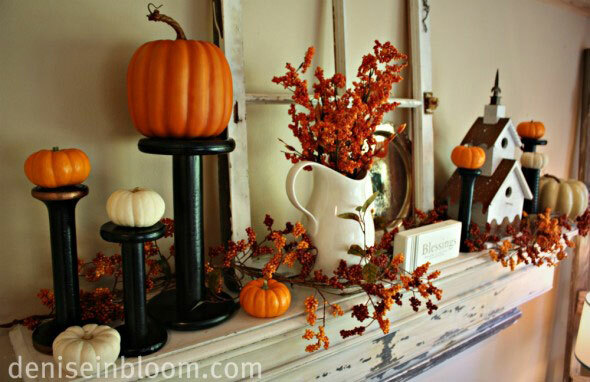 Another option to simply adding pumpkins is to simply add leaves to your mantel. This look is so fresh, pretty and classy. 10. Birch log Fall mantel by A Pretty Life In The Suburbs. 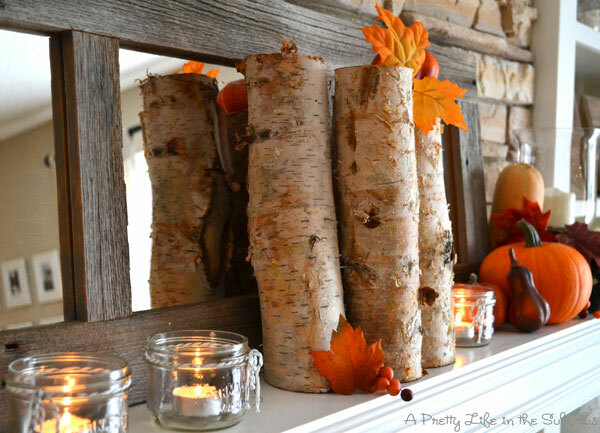 And…I couldn’t have a collection of Fall mantels without including one with birch logs! 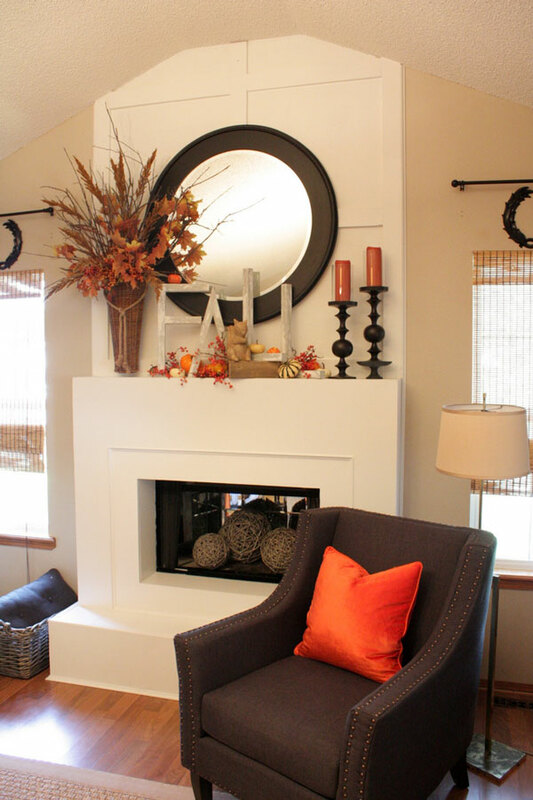 Thank you so much for featuring my fall mantel/fireplace! You have some great ones linked up.